Upper Yoopers on stage in Battle Creek for our Pioneer District Convention Fall 2018. UYBC at the Steel Bridge Pocket Park in Negaunee Township. Nature, boats, tunes and a great time! Who is da Upper Yoopers' Barbershop+ Chorus? We're a mixed chorus who love to sing in the barber shop style + others. We love to harmonize and have a great time together. Come join us! We love spreading harmony throughout our communities, you can too! All of our rehearsals are open to the public and to potential new members, so why not pay us a visit? We rehearse every Thursday evening at 6:30 p.m. at First United Methodist Church, 111 E. Ridge Street, Marquette, MI (check our event calendar for changes). 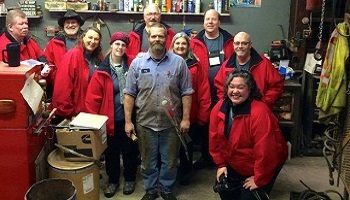 Want da Upper Yoopers' Barbershop+ Chorus to sing at your next function? 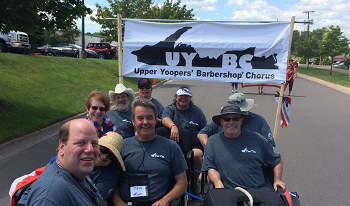 Why not hire da Upper Yoopers' Barbershop+ Chorus to entertain at your next event? We can perform at corporate functions, charity events, community Entertainment events, birthday parties, christmas parties, awards nights, weddings, engagements, anniversaries, engagements, and even funerals and memorial services.